The Oakland City Council has authorized a multimillion-dollar antitrust lawsuit against the NFL and the Raiders over the team’s impending move to Las Vegas — legal action that Coliseum officials said could result in the team leaving Oakland at the end of the upcoming season. The truly great part here, at least for a disinterested observer mostly rooting for chaotic hilarity, is that Raiders execs have reportedly told the operators of the Oakland Coliseum that they won’t renew their lease for next year if the lawsuit proceeds, which is the absolute best threat ever, since the only reason they’re still in Oakland in the first place is that they have absolutely nowhere else to go. They could play at UNLV’s 47-year-old Sam Boyd Stadium in Vegas, but team owner Mark Davis has said he doesn’t want to do that. Or they could play in some other temporary home city with an existing stadium — San Diego? St. Louis? San Antonio? — and hope that enough curiosity seekers will come out to see games to make it worth their while. It’s probably an idle threat — there’s plenty of time before next season for everybody to come to some agreement, or for the lawsuit to crash and burn — and given that the city and county would only lose a relatively piddly $3.7 million in rent from the Raiders if they left early, and that fans seem to be behind the lawsuit even if it might cost them a final lame-duck season, it’s not all that much of a risk for the public. And — say it all with me — watching this court case has got to be more entertaining than watching Raiders games. For those of you without working expertise in Las Vegas geography (like me) and without the patience to Google-map all those sites (not like me, it turns out), that comes to a little bit of parking at the stadium, with most of the spots clustered around two intersections, one about a mile to the northwest of the stadium, and another about two miles to the south. Fans would then be bused from the parking lots to the game. There are several questions that this plan raises — where you’re going to park the roughly 200 buses it would take to carry 20,000 people (assuming an average of two people per car) back to their cars immediately after the game is just one of them — but mostly it brings to mind this scenario: You are a Las Vegas Raiders fan, or just somebody visiting Las Vegas who decides to take in a game. You fire up Google or Waze or what have you, and it tells you how to get to the stadium. You drive there, and of course the lot is already full. You are directed to the overflow lot a mile away. You get there, after fighting through traffic with everybody else who is doing the same thing, only to be told that this lot is full, too — but there is more parking three miles back in the other direction. You get back in your car, head out into traffic again, and reconsider how badly you want to see a friggin’ Raiders game when there’s plenty of other stuff to do in Vegas. Maybe this is an overly grim prognostication, but it certainly seems to be a concern, at the least. As is the fact that aside from the Orleans casino, the Raiders ownership doesn’t seem to have actually finalized deals with any of the owners of the lots that they want to use for parking. The stadium is supposed to open two years from now, so somebody had better get cracking. Whoops, forgot to include the stadium renderings that David Beckham’s group released this week in my last post, probably because they’re really boring and have no fireworks or spotlights or lens flare or anything. Also not pictured: the fleet of trucks carrying off the toxic waste that sits under the site. Somebody has finally studied the actual economic impact of LeBron James on the Cleveland area, and far from the urban legend, data from the Federal Reserve Bank of St. Louis shows that overall GDP growth in the metro area has actually slowed since James returned from Miami. Now, that doesn’t mean that James is bad for the Cleveland economy — there are way bigger factors at work that affect GDP — but it does mean that at best, he didn’t really move the needle much on local earning. Can somebody please tell Drake now? The Las Vegas Raiders announced their PSL pricing, and it’s a whopping $20,000 to $75,000, more in line with what the San Francisco 49ers are charging than, say, the Atlanta Falcons or Minnesota Vikings. And there will be other seats with no PSLs attached, so if fans want to go to games, they can always opt for the no-down-payment option and just sit in the nosebleeds. I feel like I’ve seen this somewhere before and it didn’t go well — oh, right. The Arizona Coyotes have a new CEO, Ahron Cohen, so what does he have to say when asked about the team’s arena plans? “Really, the most important thing for us right now and what we’re focusing on is achieving our core goals. Those are building hockey fandom in Arizona, building a competitive team on the ice, and positively impacting our community. Ultimately, we have to figure out our long-term arena solution. But that problem is solved by achieving those three goals I laid out.” Put that into Google translate, select Corporate Bureaucrat to English, and we get, let’s see: “Hell if I know.” Glad to see some things are consistent with the Coyotes! 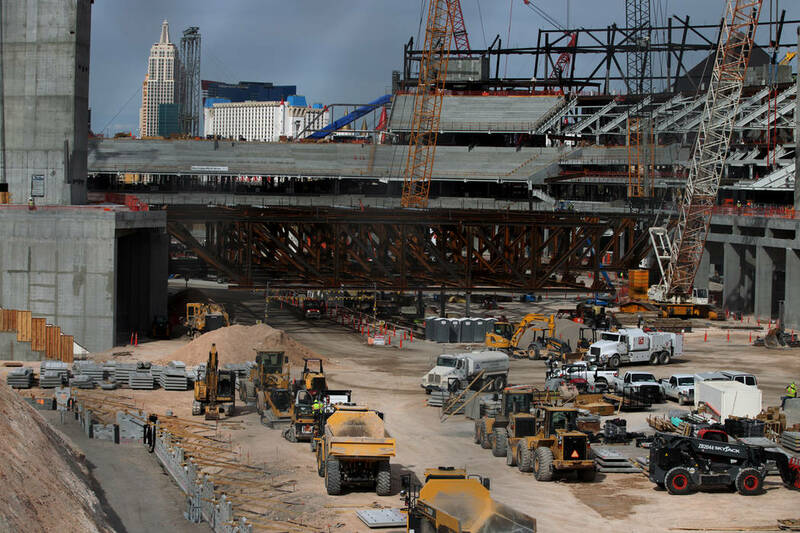 Las Vegas is reconsidering building a new highway ramp just for the Raiders stadium, not because it’ll cost too much (which it will) but because the Raiders stadium developers have decided they don’t actually want it. This is really all you need to know about the relationship between sports teams and elected officials in this country right now. Minneapolis’s tourism nonprofit overstated its economic impact figures by $200 million over the last three years, a city audit has found, figures that are used to determine things such as public stadium and arena spending. That’s bad, though given that “economic impact” is pretty much a bogus concept to begin with, the audit’s figures probably aren’t much more meaningful. The headline “Gondola From Union Station to Dodger Stadium Moves Forward” cracked me up, but maybe just because I spend so much time sitting on subway trains that don’t go anywhere. The Milwaukee Bucks have finally sold their last luxury suite, so hope you didn’t have your heart set on that suite butler. The Los Angeles Clippers owners want one of those get-out-of-environmental-review-free cards from the state legislature, because who doesn’t? 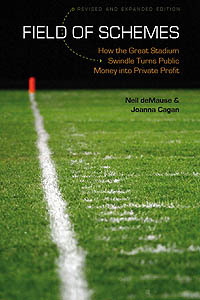 Two out of 12 stadiums built by the Brazil for the 2014 World Cup are no longer undergoing corruption probes! If you’ve calculated that that means ten of the 12 are still under investigation, you get an A+ in math. If you’ve been waiting for the first MLS owner to use the 2026 World Cup as an excuse to try to get a new stadium, New England Revolution owner Robert Kraft has got you covered. The North Carolina legislature is considering a bill to give about half a million dollars a year in property tax breaks to the Carolina Panthers and Charlotte Knights owners, apparently in exchange for nothing at all from the teams, not even a lease extension. Whether this bill goes anywhere or not, it continues to bode poorly for the upcoming stadium negotiations with the Panthers’ new owner. The Colorado Rockies owners have released renderings of the ugly building they want to build on a Coors Field parking lot they’re leasing from the state for $1.25 million a year. The renderings don’t even show any fireworks or searchlights. Sad!